Founded at Racine, Wis., A.D. 1852.
matters relating to the National Centennial of 1876. 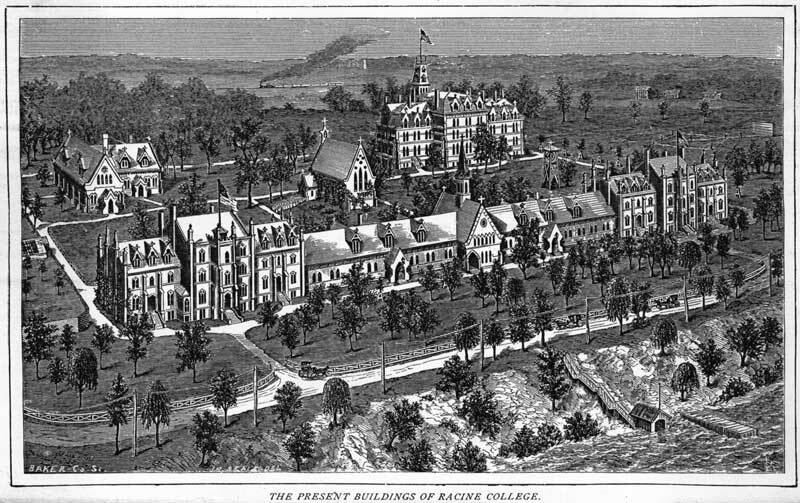 Racine College, situated in the limits of the city of Racine, Wisconsin, was founded A. D. 1852. It owes its foundation no doubt, primarily, to the conviction of those who were leaders in the enterprise, that the interests of religion and the political interests of the country so intimately interwoven with the morals of its people, demanded that the doctrines of, and the great principles of morality embraced in the gospel of our Lord, Jesus Christ, should enter prominently into the education of the youth of the land; and secondarily, to the added conviction that the branch of the Catholic church, called in this country the Protestant Episcopal, had an imperative duty lying in this direction. Prompted by this motive, the question of an Episcopal college in the diocese of Wisconsin first arose in the convention of the church assembled in Milwaukee A. D. 1851, with the venerated Bishop Kemper at its head. It was then resolved that steps should be taken for the founding of such an institution, and that it should be given to that one of the lake cities that should first secure a site of six acres of ground, and pledges of not less than six thousand dollars to put a building thereon. General [3/4] Philo White, in a letter which is recorded in the minutes of the Trustees, claims for himself and the Rev. Dr. Cole, President of Nashotah House, the sponsorship of the idea. And accordingly we find that the detail of business connected with the movement was put into the hands of a committee, consisting of those two gentlemen and Jacob Morrison, Esq. The church in Racine at this time was few in numbers and feeble in means; but, aided by the local interest which now came into play, it entered spiritedly into the contest with its much stronger rival in Milwaukee. Two influential citizens of the place, Dr. Elias Smith, still a Trustee of the institution, and Marshall M. Strong, late a Trustee but now dead, took the matter in. hand, and in a very short time, in advance of all other competitors, had not only met but gone much beyond the requirements of the resolution of the convention having secured a site of ten acres, and subscriptions to the amount of $10,000 for a building. So Racine had won the location. The site, donated by Charles S. Wright and his brother Truman G. Wright, was all that could be desired. Racine city, as is well known, is situated on a neck of sandy and gravel land, lying high and dry between a far extending prairie on the west, and Lake Michigan on the east. On the narrowest part of this neck of land, with the native forest trees still standing, about one mile and a half south of the central part of the city, the college is located; and to those fond of broadly extended and varied views, nothing could be more picturesque and pleasing. The fertile prairie dotted with its farm houses and frequent clusters of trees, and the boundless expanse of the lake covered with its [4/5] numerous sails and other crafts of commerce, fall at a glance under the eye of the beholder from the college lookout, and what is of still greater importance, the location is unexcelled in healthfulness. Such a site being secured, and the subscription in hand for the proposed building, application was immediately made to the legislature for a charter, which, with liberal provisions, was granted on the 3d day of March, A. D. 1852, and entitled "An act to incorporate the Board of Trustees of Racine College." The names of the corporators given in this charter are as follows, in their order: Roswell Park, Elias Smith, Isaac Taylor, Philo White, Isaac J. Ullman, Matthew B. Mead, Nelson Pendleton, Marshall M. Strong, Joseph H. Nichols, Jackson Kemper, Benjamin Akerly, Thos. J. Ruger, William Adams, Eleazer A. Greenleaf, J. Bodwell Doe and Azel D. Cole, and it was provided that they should choose their own associates and successors. The first meeting of the board was held on the 10th day of March, A. D. 1852, and presided over by the Rev. Joseph H. Nichols, the Rector at that time of, St. [5/6] Luke's Church at Racine. [The Rev. Joseph Hurlbut Nichols, A. M., the first President of the Board of Trustees of Racine College, and for nine years an honored member of its faculty, was born on the 20th of August, 1805, at Newtown, Conn. He was graduated at Yale college in 1825, admitted to the bar in Albany, N.Y., in 1828, and soon after became a student in divinity, and was ordained to the ministry by Bishop Benjamin P. Onderdonk, in 1881 was for some time assistant to Bishop Moore, of Virginia, and in charge of the Monumental church at Richmond; was subsequently for several years rector of Christ Church, Greenwich, Conn., and than assistant minister in Trinity Church, New Haven. From thence he was called, in 1845, to the rectorship of St. Luke's Church, Racine, and there, as noticed in the text, became connected with the college as one of the chief promoters of its organization. Shortly afterward, having resigned his rectorship of the parish, he became Professor of English Literature. In 1862, animated by patriotic zeal, though in feeble health, he entered the army as chaplain, and died at Washington the same year. Mr. Nichols was a man of high culture and fine poetic taste; was a popular magazine writer, and has left behind him some fugitive pieces of poetry of rare merit.] At this meeting it was ordered "that the corner stone of the first building be laid on the 5th day of May following," which we find was accordingly done, with appropriate ceremonies, and an address by the Rev. Mr. Nichols. At a subsequent meeting, the building in process of erection was named Park Hall, in honor of the then contemplated first president of the institution, Rev. Roswell Park, D. D.," whose name had already been placed at the head of the list of corporators. [Rev. Roswell Park, D.D., was born at Lebanon, Conn., on the 1st of October, 1807. In 1831, he graduated at West Point, having held the appointment as assistant professor for the last two years of his course. He then received a lieutenant's commission in the United States engineer corps; but during the summer furlough studied at Union College, and there received his first degree in the arts: subsequently he was stationed at Newport, R. I., then at Boston, from which latter place he was called, in 1836, to the immediate charge of the Delaware breakwater. In the same year he was appointed and accepted the professorship of Natural Philosophy and Chemistry in the University of Pennsylvania. In 1842, he resigned his professorship and removed to Burlington, N.J., and there studied Theology, and was ordained to the ministry the same year. Soon afterward he opened a private school in Pomfret, Conn., which he carried on with great success till 1852, when he was called to the presidency of Racine College. During most of the time of his connection with the college, he was also rector of the parish church, Professor Nichols having resigned that position on account of ill health. Upon the dissolution of his connection with the college, he removed to Chicago and opened there a private school, which he successfully carried on until the time of his death, which happened on the 16th of July, 1869. The published works of Dr. Park are a brief history of West Point, a large work entitled Pantology, or a systematic survey of human knowledge, and several volumes of poems, which are characterized by Dr. Everest, from whom this note is abridged, as being pervaded by a tone of true feeling, and at times by a vein of lively and pleasant humor.] At a meeting of the board held about the first of November in the same year, Dr. Park was unanimously elected to the presidency of the [6/7] incipient institution, and of its Board of Trustees. He accepted the election and immediately entered upon his work with all the enthusiasm of an ambitious tiller of virgin soil. On the 15th day of the same month he opened the school, Consisting of nine scholars, in a hired room, under the chartered name of Racine College. And in addition to the labor of the school, in which he was the only teacher, he seems to have taken upon himself the chief direction of the building and the management of the finances. At a special meeting held on the 18th day of July, 1853, the following were added to the faculty: Rev. Joseph H. Nichols, A. M., Professor of English Literature; Marshall M. Strong, Esq., Lecturer on Political Science, and P. H. Hoy, M. D., Lecturer on Physiology and the Natural Sciences, and three young men as assistant teachers. On the 28th of this same month the first collegiate year closed with 33 students, and the first commencement was held, and Benjamin A. Segur, B. S., and Elijah Y. Smith, are the first recorded graduates. On the 14th day of September following, Park Hall was finished and ready for occupancy, and within its walls the second collegiate year was entered upon. In his first annual catalogue Dr. Park thus describes this building, which is given here, as it was in some respects a model for subsequent ones: "The edifice is built of pale brick, in Gothic style, and is 120 feet long and 34 feet wide. The central part which projects to the front contains four large recitation rooms, besides a chapel, with open roof, occupying the whole of the upper story, and a kitchen and dining room in the basement. There are ten rooms in each wing designed for students' [7/8] dormitories." [The interior of this building was subsequently remodeled, and so changed that it would not be recognized from this description.] To this description the Doctor adds the following: "The building was erected under the direction of a committee appointed by the subscribers, and consisting of Dr. Elias Smith and the Messrs. Isaac Taylor and John M. Cary, to whom the thanks of this community are eminently due for their assiduous, judicious and gratuitous prosecution of the work to a successful close." The college being thus housed, and having an abiding place, it is worth while here to stop our progress for a moment, in order to see what was the literary standard set up, and just how far it was a Protestant Episcopal institution. As to the former, the following is the description taken from the programme of the first catalogue: "Besides the preparatory department of Racine College, open to younger scholars, there will be two courses of study pursued in this institution, according to the aims and resources of the student. The full course is designed for those who wish to enter the learned professions, or at least to pursue an extended course of study. It will be conformed to the ordinary standard of American colleges. * * * The shorter course is designed for those students who wish to obtain a superior education, and then to engage in business pursuits. It may be entered upon at once, by those who are proficient in Arithmetic, Geography and English Grammar, without any previous study of Greek and Latin, and it may be completed in two years. So that a youth entering at fourteen may graduate at sixteen, and receive the lower degree of Bachelor of [8/9] Science, if he shall have sustained his examinations. Competent students, after graduating in the shorter course, may complete the full course in two years more, by close application, and then receive the ordinary degree of Bachelor of Arts." As far as the objects of the two courses here laid out are concerned, the curriculum of studies prescribed is well fitted to meet them, but the writer is constrained to remark, that when it is implied that a youth of fourteen, with the required attainments, may obtain a superior education in two years, or graduate in four years with full college honors, reference must be had only to youths of very extraordinary ability. "1. That in all future elections to the Board, preference be given to communicants or members of the Protestant Episcopal Church, unless there be special reasons to the contrary. "2. That the Bishop of the diocese be ex officio a member of this Board and visitor of the College, with authority at all times to examine fully into the state of [9/10] its affairs, and to report on the same at any meeting of this Board. "3. That the President of the College and the majority of the Faculty shall be communicants or members of the Protestant Episcopal Church. "4. That the Book of Common Prayer of this church shall be used with the Bible regularly in the daily devotions." So far, at this time, was the college a Protestant Episcopal institution. But that it was extremely liberal in the conduct of its affairs, is evident from the following statement found in the early catalogues: "Divine Service is performed every Sunday in the college chapel, but the students are free to attend any place of worship which they may choose, or their parents may desire." And further, it does not appear that any definite church instruction was given to the students, and in the list of text books used, no catechism or any other book of a church character (if we except Adams' Christian Science) is included. In the spring of 1857, so prosperous had the institution become financially and in respect to number of students, that a second building was declared necessary, and for this, without reference to their ecclesiastical connections, the citizens of Racine again came to the front with liberal hand, enabling the Doctor to report in November of the same year, as follows: "In April and May last, the citizens of Racine munificently subscribed $12,000 for the erection of a second college building, a twin to the first, the corner-stone of which was laid by Bishop Kemper on the 4th day of last July, and the exterior of which is now completed so that it may be finished internally for the use of the English department in the coming season. The work has been thoroughly executed under the charge of a building committee consisting of Isaac Taylor, Lyman W. Monroe and Dr. Elias Smith, of the board of trustees, L. Bradley, Esq., being the architect." This building is [11/12] located about two hundred and forty feet south of Park Hall, and, with it, fronting the lake shore road. We have now passed in our review the last year of Dr. Park's presidency, and because radical changes followed thereupon and a general reconstruction of affairs, we may say that here ends the first stage of the history of the institution. And, before entering upon the second stage of its history, it would be wrong not to turn aside from our progress for a moment, and, so far as can be done in a sketch like this, give honor to whom [12/13] honor is due, in starting an enterprise which promises to be of so great importance to coming generations. To the citizens of Racine, generally, the college owes a great debt of gratitude, not only for liberal contributions, but for an abiding interest in all its affairs, without which it could not have existed. But, without being invidious, I may name the following: Isaac Taylor, H. S. Durand, Nelson Pendleton, A. McClurg, Charles Wright & Brother, Lee & Dickson, L. W. Monroe, Charles Herrick and Gen. Philo White as the largest contributors of money; and Marshall M. Strong, Esq., who was not only a large contributor, but whose counsel and personal efforts down to the day of his death were of inestimable value; and Dr. Elias Smith, who, at every demand, has always contributed to the fullest extent of his ability, has been an active member on every building committee, and has stood, and still stands as a sentinel to give warning of any impending danger. To these men in particular, among the citizens, is the college greatly indebted for its foundation, but more especially to its first president. From the time that Dr. Park came upon the grounds, he was the acknowledged leader, not only of the educational work, but in all the financial interests; always forgetful of self, with nothing for his salary except what was left when all other claims were met, he toiled on until the management was transferred to other hands, with one building complete, another nearly so, no debt incurred, and a property worth $30,000. [In one report, after summing up his balance sheet for the year, he adds, "leaving for president's salary, $7."] Hence, he is most justly entitled to the legend on his tomb beneath the chancel window of the [13/14] chapel: "REV. ROSWELL PARK, D.D., the FOUNDER and first President of Racine College." HISTORY OF RACINE COLLEGE IN ITS SECOND STAGE. We pass now to the history of Racine College in its second stage, which entered upon in the autumn of 1859. "To the Honorable, the Board of Trustees of Racine College. "GENTLEMEN.--In order to effect the union of St. John's Hall with this institution, I hereby resign the office of President of Racine College and of its Board of Trustees, with grateful remembrance for all your past kindness, and fervent prayers for your future welfare. His resignation being accepted, and due complimentary resolutions passed, the Rt. Rev. Bishop Kemper was elected President of the Board of Trustees, and the Rev. James Be Koven, Rector of the College; [This title implies the same as President. It was subsequently changed to that of "Warden;" and hereafter this office will be spoken of under this last title.] the [15/16] Rev. J. S. B. Hodges, Vice Rector; [Mr. Hodges did not accept.] the Rev. H. C. Shaw, Head Master of the Grammar School, and the Rev. Edward Seymour, Assistant Master. Professor Wheeler was transferred to the Mathematical Department, and Doctor Park was made Chancellor and Professor of Natural Philosophy and Chemistry. The chair of Latin and Greek was left to be filled, for the time being, by the Warden. The union being thus consummated, the new building was soon completed, and, in honor of Bishop Kemper, named Kemper Hall. On the 5th day of October, Racine College entered upon the work of its second stage in two divisions, a Grammar School and College proper, of which a further account will be given when we come to speak of the work done. By the consent of all, the institution was now definitely proclaimed to be a church institution, not only in name, but in fact. In the first register published afterwards, it was declared "that the object of the institution was to educate the youth placed in it through the agency of the church of the Living God, and in the principles of the Catholic faith as held by the Protestant Episcopal Church in the United States, and with an especial view, moreover, to the preparing for the study of Theology, those intending to become Clergymen." And accordingly we find now, for the first time in the list of text books, such as the following: Church Catechism, Nicholl's Help to Reading the Bible, Theophilus Americanus, and other books of a like character. This proclamation was equivalent, of course, t throwing the institution for its support exclusively upon the church, and those who, though not of the church, were not afraid of her teaching. As might have been expected, very few of the students of the previous year returned, and the classes were, for the most part, made up of the young men, about thirty in number, whom Doctor De Koven had brought with him from St. John's Hall. So it may be said that, for this year at least, the college was dependent on the "daily bread" fund of Nashotah House. It is worth while at this point to notice the following features in the government of the institution, now inaugurated, as they undoubtedly had much to do with its subsequent popularity. Except day scholars, who boarded at home with their parents, the students were all required to board in the college buildings, and after the former statement in the Register with reference to the religious character of the institution, we read the following: "The rector and three of the clergy reside with the students in the college buildings, and direct the internal government and discipline of the college. They devote their whole time and care to the duties of the institution, with the endeavor to realize the idea of a Christian family, where the teachers are elder brothers, and the scholars dutiful, obedient younger members, all working together for the good of each other and the glory of God. As a family they all meet together in a common dining hall, and as a family they all pray together, morning and evening, in the daily service of the church, in the college chapel. It is believed that in this way boys and young men are best shielded from sin and [17/18] evil when away from the shelter of home and the care of parents." These features of college life, new in this country, if perhaps we except St. James College, Maryland, seemed to arrest the attention of parents having sons to educate. At any rate, during the following year, there was a large increase of pupils, the number rising from forty to upwards of sixty. This year, which was the eighth of the college, the faculty also was increased by the addition of Mr. E. B. Spalding, A. M., and H. H. Van Dusen, A. M., young men graduates of Hobart College, N. Y., as assistant masters in the Grammar School. The year 1862 was especially marked by the procurement of the contemplated amendment to the charter, which provides that the Bishop of the diocese, the president of Nashotah House, and the Warden of the college, shall be ex officio trustees, and that all trustees hereafter elected shall be communicants of the Protestant Episcopal Church. On the 10th day of July this year, the first class under the present wardenship was graduated. It consisted of the following six young men: Wm. Cox Pope, Thomas L. Bellam, Stephen W. Frisbie, Wm. J. Pigott, George A. Whitney, and George Vernor. These graduates were all preparatory students of Nashotah House, and are now all laboring in the ministry in different parts of the country, one, Mr. Bellam, being the rector of Jarvis Hall, Colorado. In 1863, the first set of statutes was passed by the trustees and published, and under these statutes the board of fellows was organized, which, with some subsequent changes with respect to membership, privileges, [18/19] and duties, has continued down to the present day. It holds its meetings once a month, and is regarded as under the Warden, the governing body of the internal affairs of the institution. The eleventh year, 1862-3, was marked by the following changes in the faculty: Prof. Nichols resigned and entered the army as chaplain Dr. Park also resigned both his offices, chancellor and professor, and Rev. J. C. Passmore, D. D., late of St. James College, Maryland, was called to and accepted the chair of Rhetoric, Intellectual Philosophy and Political Economy. Dr. Passmore brought to this chair a long experience, having been for twenty years professor in St. James College, and rare qualifications, and added much to the intellectual standing of the institution. In 1864, the Warden, feeling that the burden of the discipline and the general oversight of the institution was too much for one man, created on his own authority the office of "Head Master of the College," and placed in this office Mr. E. B. Spalding, now the Rev. E. B. Spalding, who had already proved his efficiency in the government of the grammar school. Mr. Spalding has held this office down to the present time, it having been subsequently established by the trustees, the title changed to that of "Subwarden," and ranked as the second office of the college; and in the establishment of that good order which has all along characterized the institution, he has ever been intimately associated with the Warden. In the year 1864, on the 15th day of January, the college met with its first calamity by fire. Park Hall, with the exception of one wing, was burned to the ground. In this conflagration nearly all the library, [19/20] the cabinet and philosophical apparatus which had been gathered by the assiduous labors of Dr. Park, were lost, together with our neat upper room chapel. It is worthy of notice that so well ordered was the discipline at this time, that though all the lecture rooms were destroyed, and about fifty students deprived of their dormitories, yet only one day was lost from the regular class work, said no more than two or three students left. The parlors and guest rooms of Kemper Hall were converted into study and lecture rooms; the dormitories there were multiplied; a chapel was extemporized in one corner of the gymnasium, and in a very few days every thing was going on as usual. It is said that a fire (though nothing can be more terrible at the time being) is often a blessing; so it proved in this case. Sympathizing friends both in and out of Racine, came forward with liberal hand, and with the aid of the insurance, before the next autumn the burned building was restored in an improved condition, and a new chapel, a separate building, was in process of erection, the corner stone being laid by Bishop Kemper on the 18th day of August, 1864. As this is one of the permanent buildings of the institution, I here give an outline of its description. It is located on a line half way between Park and Kemper Halls, and about 200 feet west, designed to be the centre of the contemplated quadrangle. It is built of the pale brick of Racine with red brick ornamentation, the walls are high and the roof Gothic and open, the windows are filled with richly stained glass. Its dimensions are 90 by 30 feet, besides a robing room and organ chamber. It will seat about 300 persons. Very [20/21] few churches in the country are more admired. The whole cost, including organ, was nearly $18,000. Another important event of this year was the enlargement of the College domain from ten to ninety acres. This enlargement was made by purchase from the estate of the late M. M. Strong, Esq., of the board of trustees. Mr. Strong had secured the land for this especial purpose in his own name previous to his death, which happened in the spring of this year. A large part of it 1mw under thorough cultivation constitutes the College farm. To the lamented Strong, who died in the spring of 1864, we have to add the names of Nelson Pendleton and Isaac Taylor in 1865. All these gentlemen were among the largest contributors to the College and its staunchest friends, and all members of the board of trustees from the first. Mr. Taylor, who was a man of wealth, had long been considering a plan for advancing the usefulness of the College by the endowment of some charity connected with it, or the erection of another building, but was taken away suddenly, before his plan was fully matured, leaving all of his estate to his widow. One year afterwards, in October, 1866, Mrs. Taylor also died, having, among her other munificent charities, in accordance with her late husband's wishes, bequeathed to Racine College the sum of $65,000, of which $30,000 were to be used in the erection of a building, $5,000 as the trustees might decide, and the balance to be securely invested chiefly for the educational benefit of the orphan sons of Episcopal clergymen in the diocese of Wisconsin. This noble foundation was the first and is the only endowment of the institution. In pursuance of the provisions of the Taylor bequest, the corner stone of Taylor Hall [21/22] was laid on the 22d day of June, 1867, and the building finished and occupied before the following Christmas. This edifice, the most imposing Of any yet built, is located on the northwest corner of the quadrangle, about 400 feet west of Park Hall. In its shape, with the exception of the roof, it follows the original model, but is much larger. It is about 150 feet in length and 60 in width, besides a tower projecting from the west front. The roof is Mansard. Including the basement and attic there are five floors. As restored (it was burnt a year ago as noticed further on), it furnishes the library and five lecture rooms, and the remainder is fitted to accommodate upwards of fifty students with study and bed rooms, besides the families of Warden and Subwarden. The original cost of the building was about $36,000. I stop progress here a moment, to give a summary of certain changes in, and additions to the faculty, down to the present time, and of other matters which could not well be introduced in chronological order. In 1865 Rev. Geo. W. Dean, A. M., was added to the faculty as Professor of Latin and Greek; in 1866 the Rev. Alex. Falk, Ph. D., as Professor of German and History, and Rev. R. G. Hinsdale, A. M., as Professor of Chemistry and Geology, and in 1867 the Rev. J. J. Elmendorf, S. T. D., as Professor of English Literature and Philosophy, the previous occupant of this chair, the Rev. Dr. Passmore having died, much lamented, in 1866. In 1872 Prof. Dean resigned his chair, Dr. Falk was transferred to the newly created chair of Greek, and Rev. J. H. Converse, A. M., was called to and accepted the chair of Latin, the professorship of History and Political Economy being given to the [22/23] Subwarden. In 1873 the chair of Physics and Astronomy was created. Up to this time the duties of this chair had been fulfilled by the Professors of Mathematics and Chemistry; to this chair the Rev. C. N. Spalding was called, but did not accept until the fall of 1875. The grammar school, which has not demanded our separate attention, though a large majority of students have always been members of it, has in all these years moved on with a full organized faculty of instruction under the supervision of the Warden and Subwarden, the studies being directed by the board of fellows as by statute provided. This department is arranged in six forms, the full course requiring six years. A youth having completed the sixth form is ready to enter the collegiate department. Rev. Henry C. Shaw, B. D, Adj. Prof. Latin and Greek, 1859-1869. E. B. Spalding, A. M., Head Master, 1860 (now Subwarden). H. H. Van Dusen, A. M., Assistant Master, 1860-1867. S. Herbert Taylor, Tutor, 1862-1864. B. F. Fleetwood, A. B., Tutor, 1863-1865. Geo. Burton, A. B., Tutor, 1864-1865. Rev. Chas. S. Siebt, Tutor in German, 1865-1867. Rev. Watson B. Hall, A.B., Adj. Prof. Math., 1865. Dan. Marvin, A. M., Adj. Prof. Greek, 1867-1871. Giles H. Hallam, A. B., Tutor, 1867-1868. Henry K. Huntington, A. B., Tutor, 1867-1868. Rev. T. D. Pitts, A. M., Adj. Prof. Eng. Lit., 1888-1871. George S. Mead, A. B., Adj. Prof. Hist., 1868. Walter R. Fales, B. D., Tutor, 1868-1871. Samuel M. Hudson, A. B., Tutor, 1870-1871. G. B. Morgan, A. B., Tutor, 1870-1871. Rev. Arthur Piper, A. M., Tutor, 1871. Rev. F. S. Luther, A. M., Rector of School, 1872. Edward C. Gould, A. M., Tutor in Greek, 1878-1875. Horace H. Martin, A. B., Tutor, 1875. Gerald R. McDowell. A. B., Tutor, 1875. Chas. Truesdell, A. B., Tutor, 1875. COURSE OF STUDIES IN CLASSICAL SCHOOL. Mathematics and History--Arithmetic; Davies' Intellectual. English and Miscellaneous--Spelling Reading, Writing. Geography; Guyot's Intermediate, with Outline Maps. Clark's Beginner's Grammar. Specimen Letters. Sacred Studies--Bible Questions. Mrs. Weston's Catechism. Mathematics and History--Arithmetic; Davies' Practical. English and Miscellaneous--Spelling, Reading, Writing. Geography; Guyot's Common School, with Outline Maps. Clark's Beginner's Grammar. Specimen Letters. Sacred Studies--Chosen People; Yonge. Biblical Questions. Collects. Church Catechism. Mathematics and History--Arithmetic; Davies' University. History of the United States; Quackenbos. English and Miscellaneous--Spelling, Reading, Writing. Clark's Normal Grammar. Specimen Letters. Sacred Studies--Maclear's New Testament History. Biblical Questions. Collects, Church Catechism. Ancient Languages--Casear; Allan and Greenough's Latin Grammar. Hadley's Greek Grammar. Boise's First Lessons in Greek. Mathematics and History--Arithmetic; Davies' University (finished). Berard's History of England. English and Miscellaneous--Spelling, Writing. English Grammar; Bullion. Specimen Letters. Ancient Languages--Virgil; six books. Harkness' Latin Composition Zenophon's Anabasis; three books. Hadley's Greek Grammar. Mathematics and History--History of Greece. Algebra; Davies' University, to Equations of the second Degree. English and Miscellaneous--Spelling, Writing. Declamations. Composition. Natural Philosophy; Quackenbos. English Literature; Gilman. Hart's Rhetoric. Ancient Languages--Cicero's Orations against Catalina, on the Manilian Law, and for the Poet Archias. Harkness' Latin Composition. Xenophon's Cyropaedia: two books. Homer's Iliad; four books. Hadley's Greek Grammar. Greek Composition. Mathematics and History--Geometry; six books. History of Greece. English and Miscellaneous--Spelling. Declamation. Composition. Fowler's English Grammar. COURSE OF STUDIES IN MATHEMATICAL SCHOOL. English and Miscellaneous--English Grammar; Bullion. English and Miscellaneous--Practical Bookkeeping. Declamations. Hart's Rhetoric. German--Otto's German Grammar. Conversations. Translations. Englishand Miscellaneous--Fowler's English Grammar. Theme writing. Declamations. Linear and Free Hand Drawing. Natural Science--Pynchon's Chemical Physics. Experiments. The general dining hall, or refectory, up to 1871, had been in the basement of Kemper Hall. This becoming crowded and inconvenient, the trustees, in the spring of this year, took measures to provide a separate building to be used for this purpose. A committee, consisting of J. S. Rumsey, Esq., and Edwin H. Sheldon, of Chicago, was appointed to take the matter in hand. By hard work, and the aid of subscriptions raised the [24/25] previous year by Professors Falk and Wheeler, in aid of an endowment (the subscribers Consenting to have them go in this direction), the money needed was raised and the building erected. It stands at the north end of Kemper Hall, is about 100 feet long and 30 wide, all finished in one room. During the next season (1872), another building was added to this for school rooms and recitation rooms, for the grammar department. These two [25/26] buildings fill up the entire space between the two original halls, and complete the east front of the quadrangle. With the exception of the central part, which consists of two stories and is surmounted by a bell tower, they are both built one story, with open roof, the architecture harmonizing with that of the other buildings. The college now presents on the east an imposing front, 450 feet in length, unbroken, except by an archway in the center. After the completion of these buildings, down to the year 1875, the events were of no particular importance to the continuity of this sketch, but this year was made memorable by our second calamity by fire. Taylor Hall, the pride of the institution, let it be noticed, contained the library--carefully selected from time to time, and very valuable for its size; the laboratory, with all the chemical and philosophical apparatus; the lecture-rooms of the college proper; the rooms. of the Warden and Subwarden with their private libraries; the college clock with its peal of bells, which had been put up two years before at a cost of nearly $2,000, [26/27] and the rooms of about fifty students, many of which had been expensively furnished by themselves. At 5 o'clock on the morning of February 4th, while all the inmates were sleeping, the cry was raised by the night watchman that Taylor Hall was on fire. The fire had broken out in the roof from a defective flue. The morning was bitterly cold, the wind blowing a gale, fortunately not in the direction of any other building. In two hours, the, whole structure, excepting the walls, with nearly all that it contained, apart froth the living beings, was in ashes. The loss in this conflagration, over and above the insurance, was about $15,000, besides private losses, and this was not all; for, though the grammar school was undisturbed by the event, and the work there went on in its usual course, the collegiate department had to be suspended for several weeks, the students going to their homes to remain until accommodations could be provided for them in the other halls and in the private houses of the professors, and, when all was done that could be done, many facilities previously enjoyed were lacking; but, let it be said to the great credit of the students that, with but one or two exceptions, they all proved themselves loyal in this distress, returning at the appointed time and resuming their studies in the face of all the disadvantages and discomforts. A special meeting of the Board of Trustees was held on the 24th of February, at which it was resolved to proceed to the work of restoration as soon as an adjustment could be made with the insurance companies, and meanwhile circulars were bent out and agents appointed to solicit aid for supplementing the receipts on the [27/28] policies, and if possible to enable the Trustees to accomplish more than simply a restoration from the losses. Although responses to this call were not as large or numerous as it had been hoped, yet there was much in them at which to rejoice. Receipts and promises came in sufficient to warrant the trustees to venture upon another and much needed building for a permanent gymnasium and laboratory. The contracts for both buildings were let in April, and they were ready for occupancy in September of the same year. Taylor Hall as restored, has already been described, and is much more commodious than it was originally. Room has been much economized and the building is warmed throughout by steam. The new building that constitutes the gymnasium and laboratory is located on the southwest corner of the quadrangle. It is built with Gothic roof. The dimensions of the main part are 100 feet by 30 feet, all in one room. This is the gymnasium, and is well furnished with all the implements for physical exercise usually found in such places. The laboratory is a wing on the north, about 40 feet by 36 feet, and has during the past year, by the diligence of the professor in that department, been well furnished with new apparatus and furnace, affording all the ordinary facilities for chemical analysis and assaying. Hereafter no student desiring to pursue these important branches of science need turn away from Racine College to find advantages for pursuing them successfully. I deem it proper to say in this connection that the library, though not fully restored to what it was before the fire, is gradually increasing, by the addition of [28/29] valuable books, selected with special reference to the needs of the classes. Both the college proper and the grammar school have always embraced two courses each, originally called the scientific course and the classical course, now denominated the school of science and the school of letters. Those graduating in the former receive the degree of Bachelor of Science, those in the latter the degree of Bachelor of Arts. The programme of studies pursued, in each course in the college proper is given in the note below, after the list of the present faculty. Rev. James DeKoven. D. D., Warden. Rev. E. B. Spalding, A. M., Subwarden. DEANS AND FACULTIES OF COLLEGIATE SCHOOLS. Rev. James DeKoven, D. D., Dean of the School of Letters. Rev. Charles N. Spalding, A. M., Dean of the School of Science. Rev. Homer Wheeler, A. M., Professor of Mathematics. Rev. Alexander Falk, Ph. D., Professor of Greek and German. Rev. R. G. Hinsdale, A. M., Professor of Chemistry and Geology. Rev. J. S. Elmendorf, S. T. D. Professor of Philosophy and English Literature. Rev. John H. Converse, A. M., Professor of Latin. Rev. E. B. Spalding, A. M., Professor of History and Political Economy. Rev. Charles N. Spalding, A. M., Professor of Astronomy and Physics. COURSE OF STUDY IN SCHOOL OF LETTERS. Sacred Studies--Collects. New Testament History, Smith. Blunt's Lectures on the Catechism. Ancient Languages--Livy. Horace (Odes). Cicero (De Senectute et De Amicitia). Latin Composition. Herodotus. Homer. Greek Prose Composition. Xenophon's Mem. Mathematics and Natural Sciences--Algebra (finished). Geometry (finished). Philosophy and Belles-Lettres--Declamation. Composition. History and Structure of the English Language, Angus. Ancient History. German and French. [The study of German and French is voluntary, and at extra charge]. Sacred Studies--Ellicott's Life of Christ. New Testament History, Smith. Blunt's Lectures on the Catechism. Ancient Languages--Horace (Satires, Epistles). Cicero (De Officiis or Tusculan Disputations). Latin Composition. Plato. Lysias. Greek Prose Composition. Mathematics and Natural Sciences--Plane and Spericel Trigonometry. Mensuration. Analytical Geometry (begun). Natural Philosophy. Philosophy and Belles-Lettres--Composition. Declamation. Logic. Formal Rhetoric. Forensic Discussions, Whately. History of the Middle Ages, and Modern. History to the end of the Thirty Years' War. German and French. [The study of German and French is voluntary, and at extra charge). Sacred Studies--Palmer's Church History. Greek Testament. Ancient Languages--Tacitus. Plautus. Terence. Latin Composition. AEschylus. Sophocles. Demosthenes (De Corona). Mathematics and Natural Sciences--Analytical Geometry (finished). Calculus. Chemistry. Guyot's Earth and Man. Geology. Philosophy and Belles-Lettres--Critical Essays. Declamation. History of English Literature. Aesthetics. Physiology, Porter. Modem History (finished). Lectures on Statistics and Political Geography. German and French. [The study of German and French is voluntary, and at extra charge]. Sacred Studies--Lectures on the Prayer Book, and on Christian Doctrine. Greek Testament. Ethics. Evidences of Natural and Revealed Religion. Ancient Languages--Juvenal. Lucretius. Thucydides. Aristophanes. Mathematics and Natural Sciences--Descriptive Geometry. Astronomy. Anatomy, Physiology and Hygiene. Mineralogy. Geology, Lectures. Political Economy. Philosophy and Belles-Lettres--Philosophical Essays. Original Orations. History of Philosophy. Lectures on the History of Civilization. French. [The study of German and French is voluntary, and at extra charge]. COURSE OF STUDY IN SCHOOL OF SCIENCE. Mathematics and Natural Sciences--Algebra (finished). Geometry (finished). Chemistry (Elementary). Physics. Philosophy and Belles-Lettres--Composition. History and Structure of the English Language. History of Rome. Modern Languages--German. Otto's Crammer. Whitney's Reader; Translated from English to German. Sacred Studies--Ellicott's Life of Christ. New Testament History, Smith. Blunt's Lecture on the Catechism. Mathematics and Natural Sciences--Plane and Spherical Trigonometry. Plane Surveying, Topography, Leveling, Mining. Mensuration. Analytical Chemistry (Qualitative). Physics. Philosophy and Belles-Lettres--Oratory, Composition. Logic. Inductive Logic, Mills. Mediaeval and English History. Modern Languages--German. Otto's Grammar. Select Prose and Poetry. Translated from English to German. Mathematics and Natural Sciences--Analytical Geometry. Calculus. Analytical Chemistry (finished). Laboratory Practice. Physics. Geology. Philosophy and Belles-Lettres--Composition. History of Literature. Modern History. Aesthetics. Psychology. Modern Languages--French. German. Conversation. Schiller and Goethe. Mathematics and Natural Sciences--Descriptive Geometry. Davies' Shades and Shadows. Anatomy. Physical Geography. Physics. Botany. Assaying and Metallurgy. Philosophy and Belles-Lettres--Composition. History of Philosophy. Political Economy. Modern Languages--French. German Composition and Conversation. Lectures on German Literature. The whole number of graduates down to the commencement of the last year inclusive have been, Bachelors of Science, 32 Bachelors of Art, 90. The whole [30/31] number of students that have been under instruction for a longer or shorter time, amounts to about 1,400, from nearly every state in the Union. The spiritual work, which is one of the declared objects of the institution, must also receive its notice. There have been baptized in the college chapel 108 confirmed 235; and besides the work in this direction, [31/32] connected immediately with the college, there are in the suburbs of the city, three flourishing missions, with church property amounting to $10,000, all established and carried on by the college clergy. My duty is now done except to notice a movement of the past year looking to the future, and which it is hoped may result in a third stage of the institution, which shall have a far more extended record than the two which have come under our notice. The movement alluded to will be best understood by the following circular put forth by its inaugurators, and which will serve not only as a matter of current history, with which to close this sketch, but also as an introduction to the future history of the institution. FOR THE WEST AND NORTHWEST. RACINE COLLEGE was founded in the year 1852, and has now been in operation for nearly twenty-four years. In the year 1859, a change was made in its government, making it more distinctly churchly in its discipline and care, and it has since that time been under the charge of its present Warden. Its property consists of about ninety acres of. valuable land within the limits of the city of Racine; a range of beautiful buildings between four and five hundred feet in length, including School House, Dining Hall, and two halls for the scholars of the Grammar School; Taylor Hall, a very handsome and thoroughly appointed building, containing the Warden's and Subwarden's rooms, and the studies and rooms for the College students; a fine Laboratory and Gymnasium recently built; and a Collegiate Church placed in the centre of the Quadrangle. In addition to the land and buildings, there is an endowment of about $30,000, the interest of which is devoted by the will of the donor to the keeping of Taylor Hall in repair, and to the education of the orphan sons of Episcopal Clergymen of the State of Wisconsin. There is a debt of $25,000 upon the property, so funded that it cannot give trouble to the Institution, and the interest is almost, if not entirely, met by the profits arising from the land. The property, without counting the fund of $30,000, [33/34] is worth about one hundred and fifty thousand dollars. The Charter and the Statutes of the College, which are printed with this statement, afford every security for the government and perpetuity of the College, under the care of the Protestant Episcopal Church. The Bishops of Michigan, Indiana, Nebraska, Missouri, Colorado, Wisconsin, Western Michigan, Illinois and Fond du Lac, after full conference and consideration, have determined to adopt Racine College as the Collegiate Institution of their respective Dioceses, with the determination, with the help of God, to make it a Church University of the West and Northwest. For this purpose, they are to be Trustees and Visitors of the College, with the powers accorded them in the statutes. 1. The presidency of the Board of Trustees, according to seniority. 2. In the case of a vacancy, the nomination of the Warden of the College. 4. A visitatorial power, with provision for an annual visitation. The reasons which have induced the Bishops to enter upon this work are of the gravest character, and must commend themselves to every churchman. They feel that no institution of a broad and liberal character can be established without united effort--that no single diocese can make it what it ought to be, and that the union of many dioceses in such a work is necessary to [34/35] secure enlarged interest, freedom from any narrow methods, and sufficient numbers and means to establish, a true university. They feel that the time has come for such a work, unless the church in the west is prepared to surrender its traditional character as the truest and best educator of the people. They find the most powerful motive for their present action, in the circumstances of the times, in the needs of the day, in the growing infidelity, and in the entreating cries which come from all sides for an education which shall neglect no need of human nature, and least of all the immortal soul. The have chosen Racine College, because it is the only church college proper in actual operation between Kenyon College, in Ohio, and the Pacific Ocean; and because they find in it foundations wisely laid, and only needing to be as wisely built upon. The college already comprises two schools--a school of letters and a school of science--with seven professors, whose whole time and labor are given to them. All this is apart from and independent of the large and successful preparatory department, Grammar schools, similar to which, will eventually be established in all the dioceses where they do not now exist. They have, however, chiefly been led to its selection, by the further consideration that the plan proposed by the trustees will permit the bishops to build up a university on the most liberal basis, where true freedom of thought shall prevail, guided and moulded by the conservative influences of the faith of the church. The Bishops, therefore, in His name Who has [35/36] committed to them the care of the flock of Christ, ask o the clergy and laity of their respective dioceses their prayers and assistance in the work thus begun. They can aid the plan by seeking for full information, by endeavoring to urge young men to embrace the advantages which the institution will be enabled to offer them, and by such gifts as in time shall make it what we pray it may become, a Christian University for this mighty west.